Before saw cutting, a contractor wanted to investigate the rebar spacing and reinforcement type. Also if any buried conduits and utilities were present beneath or within the concrete slab at the site. They called GPRS, LLC. 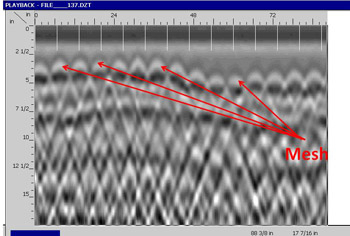 We used the GPR 1600MHz antenna to scan the area. 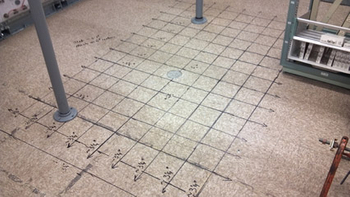 GPRS was able to locate and determine the reinforcement spacing, and mark them on the surface. No conduits or utilities were detected within the area scanned. For GPR projects or quotes in the Pittsburgh area or Western Pennsylvania, contact Jake Lammott at (412) 292-3266, email jake.lammott@gprsinc.com, or visit www.gp-radar.com.